West Whiteland Township, PA – Residents along the construction route of Sunoco/Energy Transfer Partners’ Mariner East 2 pipeline are reporting contamination in their water after pipeline drilling accidents led to a chemical slurry compromising a well, which then tainted another well and several aquifers. 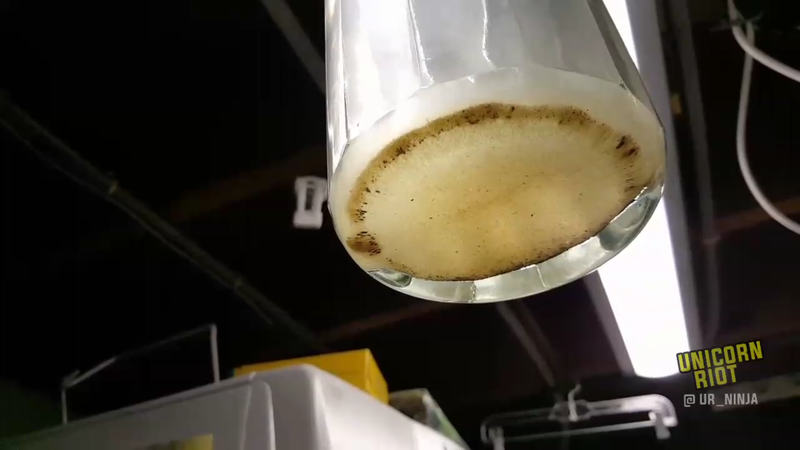 Over the last few weeks, neighborhoods in Chester County west of Philadelphia began experiencing stomach aches, and noticed their water was sometimes brown in color, contained sediment and bacteria, and smelled of chlorine. Continued drilling operations threaten to entirely destroy the safety of area wells, which would force those relying on well water to hook up to the public water system. While Sunoco has offered various forms of compensation for issues with private wells, those on the local public water system have also been reporting stomachaches after drinking water that smelled like chlorine. Correspondence between Sunoco Logistics and the Pennsylvania Department of Environmental Protection (DEP) shows that both Sunoco and DEP officials knew that drilling in certain geological formations in the Exton area could damage the local water table. Sunoco representatives downplayed the risks from the drilling slurry (a mixture of chemicals and mud) in conversations with affected residents, comparing the bentonite clay to cat litter or the foundation used in makeup. Earlier this year, Energy Transfer Partners spilled two million gallons of drilling liquids into Ohio wetlands while constructing the Rover Pipeline, leading to a $430,000 fine and the temporary suspension of their horizontal directional drilling operations. In West Whiteland, horizontal direction drill (HDD) operations were paused for a few days but resumed again on Saturday, July 8, despite objections by local lawmakers. 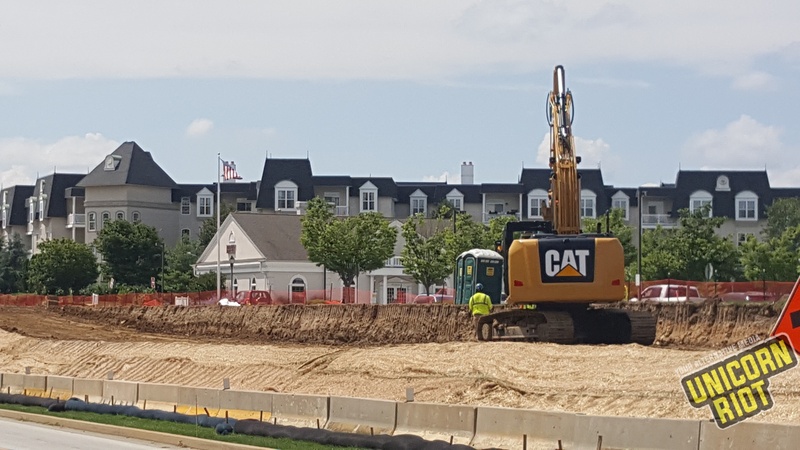 Drilling is taking place on the grounds of the Whiteland West Apartments, a development with 377 housing units. Contractors employed by Sunoco/Energy Transfer Partners are currently operating an HDD hidden from public view using poles on sheets and wooden boards. An open air waste pit for drilling waste is set up adjacent to the drill at the Whiteland West Apartments, a stone’s throw from some resident’s balconies. 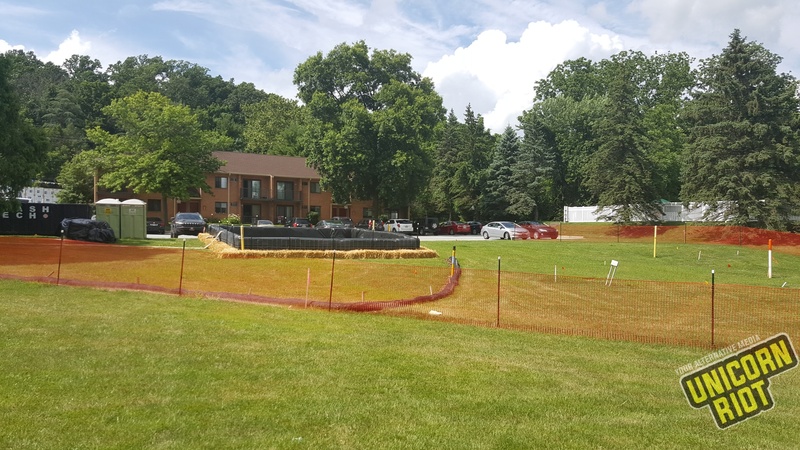 On July 3, a Uwchlan Township resident posted a picture showing how a new pipeline work site had taken up much of the playground area at her child’s daycare. Starting at frack fields in Scio, eastern Ohio, Mariner East 2 will carry highly explosive natural gas liquids such as propane, butane, and ethane across Pennsylvania to export terminals at Marcus Hook near Philadelphia. These gases could be easily ignited by everyday appliances in the event of a leak. Many local schools, homes, and an assisted living facility are all well within the blast radius should leaked gases explode. 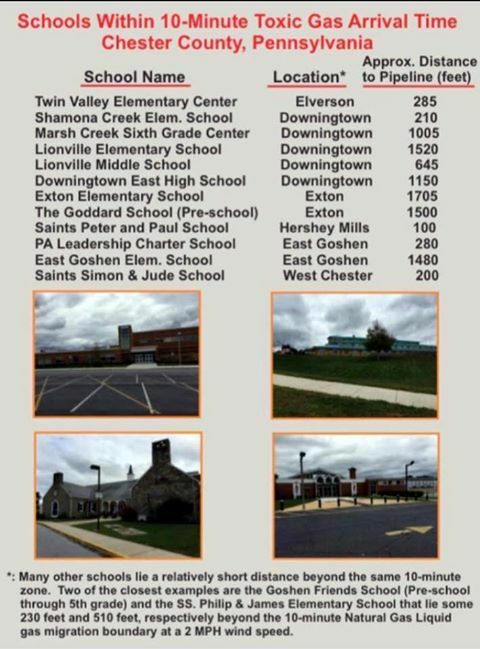 Glenwood Elementary in Media, PA has been conducting emergency evacuation drills with students to prepare for a potential pipeline leak explosion. On April 1, the Mariner East 1 pipeline, which Mariner East 2 will run parallel to, leaked 20 barrels of propane, ethane and butane in Berks County, PA. An explosion from a leaking natural gas pipeline in Pennsylvania last year set fire to forty acres of land, and left a 26-year old father covered in severe burns. Sunoco has one of the worst pipeline safety records of any company in the business. The fracking and pipeline industries in Pennsylvania, assisted by Governor Tom Wolfe’s task force to accelerate pipeline construction, have been aggressively expanding new infrastructure throughout Chester County and many other areas of Pennsylvania. Affected residents living in and along the path of Mariner East 2 across the state have been raising objections and resisting in various ways. Sunoco claims the natural gas liquids pipeline will be in operation this year; hundreds of miles of the route are still incomplete as of this writing. Military intelligence contractor Tigerswan, which worked for Energy Transfer Partners behind the scenes to disrupt and discredit the movement against the Dakota Access Pipeline, is monitoring opposition to Mariner East 2 in Pennsylvania. A consulting firm called Bravo Group boasts on its website about its contract for Sunoco Logistics to “neutralize opposition” to Mariner East 2 – a vague mission which presumably includes keeping tabs on everyone from blockaders at Camp White Pine to the various neighborhood-based Safety Coalitions formed in townships along the pipeline route.